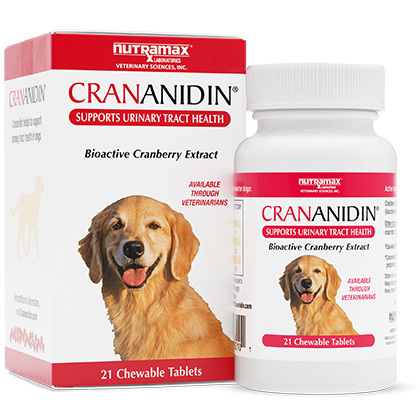 Crananidin is a chewable tablet containing bioactive cranberry extract that supports a healthy urinary tract. It is a scientifically formulated cranberry extract product just for dogs. 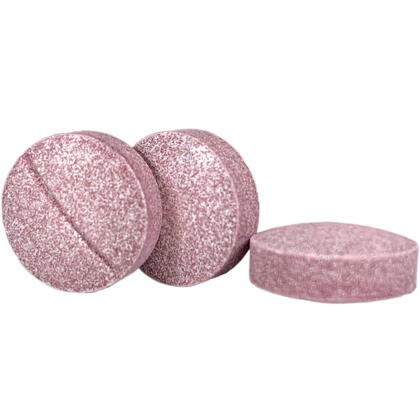 The tasty chewable tablets are conveniently scored for easy administration. Crananidin is available in a 21 ct bottle and a 75 ct bottle. When ingested, the combined ingredients of Crananidin block the adhesion of bacteria (E.coli fimbriae) to the bladder wall, which allows the bacteria to pass through the urine. For use in dogs only. There are no known side effects associated with Crananidin. Give as a supplement, or as directed by your veterinarian. Administer chewable tablets by mouth. Always provide your pet with fresh drinking water. Store in a cool, dry area out of direct sunlight. Keep lid tightly secured to ensure freshness. Keep out of the reach of children. Other Ingredients: Magnesium stearate, mannitol, natural liver flavor, and sucralose. *Crananidin contains FIM0806 cranberry extract, proprietary veterinary researched specifications.